2014 was all about a title push for Mercedes, and the W05 marks this intention. Outwardly more complex than its rivals at this stage, intriguing features are littered across the new Silver Arrow. With chassis and power unit developed under the same roof, could this new car be the fruition of a new dominant power in Formula 1? 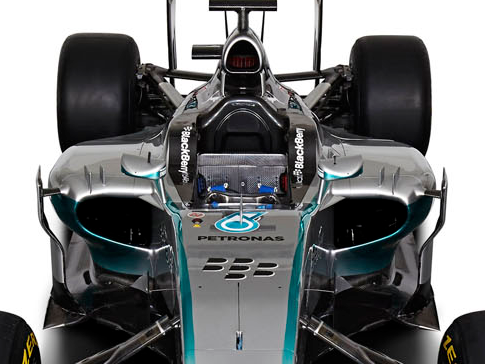 Its appearance may be similar to the Ferrari F14 T, but the W05’s nose has a party trick up its sleeve. The regulations require the tip of the nose to centre a point 185mm above the reference plane with a minimum 9000mm2 cross section. Normally, such is the demand for additional airflow beneath the chassis to produce rear downforce, a single cross section is formed to create the “finger” nose that we are widely seeing across the grid for this season. Mercedes, however, have taken a different approach. Whereas the Ferrari front wing has one uniform cross section that sweeps down steeply to meet the nose height requirement, the Anglo-German squad have twisted the definition of “nose tip” to add a bit of height to the nose itself. The apparent wing pylons are made up of two sections: the upper, thicker region and the thinner lowers that attach to the wing itself. The two thicker sections meets the cross sectional area requirements and the “pylons” are centred around the 185mm height (these are highlighted in yellow above). This therefore creates an inverted ‘u’ appearance, which allows the actual tip of the nose to be raised by a few centimeters. However, regulations state that pylons, by definition, must be placed on the car. Therefore the thicker inverted ‘u’ is attached to the thinner structures below – the actual pylons. 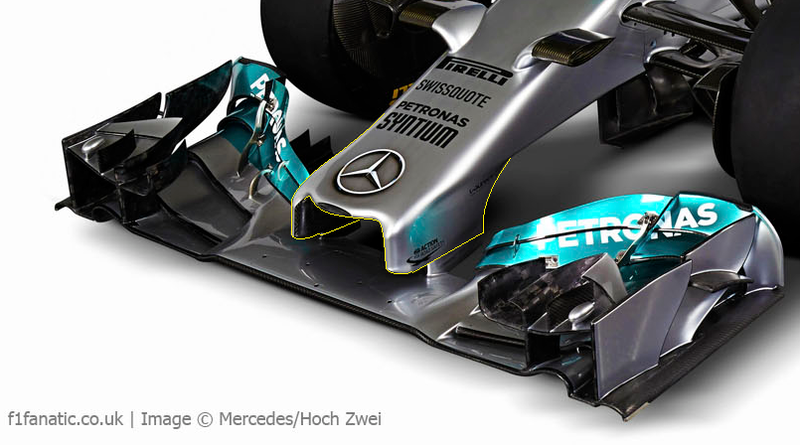 There are two key benefits of this nose design, the first being that Mercedes have stolen a nose height advantage using an alternative method to the “finger” solution. Although there is still less volume for air to pass into than the latter solution, gaining a few extra centimeters in height can result in a substantial increase in rear downforce. The second benefit is that utilising this small letterbox concept creates a venturi effect beneath the nose, inducing low pressure and therefore producing downforce directly on to the front of the car. It is unlikely that both Ferrari and Mercedes missed a trick with the “finger” nose, so the nose solutions presented on both cars could be a sign of producing substantially more downforce at the rear of the car than the competition. This is because the letterbox design produces more front downforce than the “finger” (whereas the latter is designed to produce more rear downforce due to the higher volume of airflow allowed to pass beneath the chassis). If both teams have balanced their overall, global downforce, this potentially proves that they have a performance advantage. Like the Ferrari, the Mercedes nose. also features two camera pods placed on a pair of “horns”. The regulations stipulate that the camera pods must be mounted via bodywork that acts only to support the pod, rather than be used as an aerodynamic device. Arguably, they are supporting the camera pods, but it is all a matter of interpretation. The mounts act as turning vanes to guide what-would-be upwashing airflow to the sides of the chassis between the suspension arms. Moving onto the wing itself, it carries over a lot of its design from its rather successful predecessor. Its 5-element design retains the two out-sweeping endplate fences and main cascade winglet from 2013, although a few additional aerodynamic devices have been added to confront the new, lower width front wings. Outlined in yellow are the two new cascade add-ons that stem from the main winglet. They are very similar to the ones seen on the current generation of McLaren front wing, conformed of a triangular profile with a sharp, upward-flicking end fence. The fence is aimed at the outboard section of the wing, shedding a small vortex at its trailing edge to aid airflow around the front tyre. The small yellow circles highlight the small IR sensors on top of the main cascade, adopted by the team since Monaco last year. Continuous use of these sensors suggests that the main aerodynamic effect of the cascade is done beneath the winglet rather than above it, as the sensors present an obstruction to the oncoming airflow. The large red circle highlights one of the two 3-stage turning vanes mounted beneath the chassis, each element attached to a horizontal footplate at its base. It also has an outwash design, suggesting that high energy airflow beneath the nose is being sent towards the undercut of the sidepod’s leading edge. Finally, the orange circle oversees a Lotus-esque, downward facing fence. There are two potential explanations for this device. It could be a large vortex generator, collecting airflow from the leading endplate fence and directing the torrent of airflow down towards the base of the tyre and then around it towards the floor. This has the potential to seal the sides of the floor along the sidepods, extracting further performance from the diffuser. Alternatively it could be used to transfer slightly lower energy airflow down towards a higher jet at the base of the wing, carrying both airflow paths towards one section of the car aft of the front tyre. 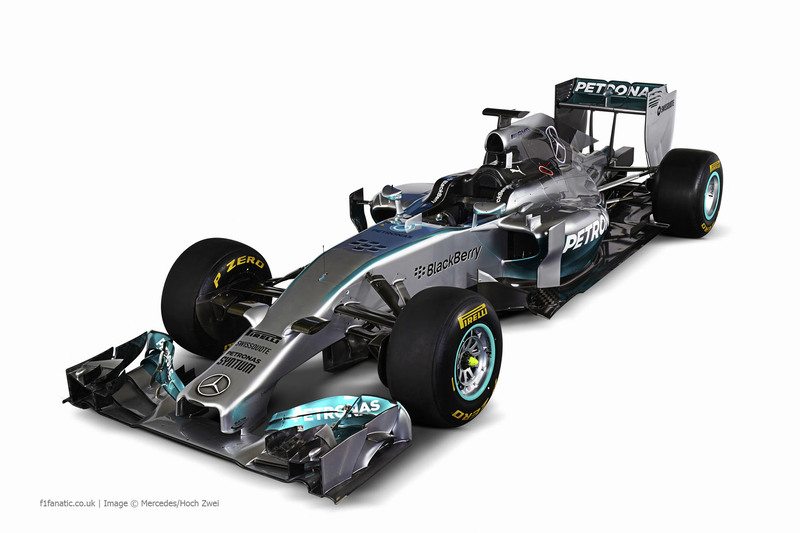 Mercedes have also opted to run a slightly stepped chassis for 2014. This increases volume beneath the car for airflow to pass into without the penalty of having an interruption in the car’s bodywork beneath the chassis that a fully stepped design produces. This is evident by the small vanity panel attached just behind the front wing mounting point. The panel can be lifted to reveal the access points for the push-rod suspension system. Around the cockpit area, the sidepods are not far away from 2013 specification. The intakes have been increased in size but not by a huge margin. This bucks the trend of Mercedes power requires larger intakes than its rivals, particularly now we have seen the Renault driven cars. The 2013 theme continues by carrying over the mirrors and canards that flank the cockpit. Slightly moved inboard are the two, tightly spaced Vortex Generators (VGs) on the shoulders of the the ‘pods, designed at directing high energy airflow towards the floor of the car. Each side of each sidepod is surrounded by a crinkled air conditioner, designed to shield the undercut – which is quite extreme on the W05 – of the turbulent wake caused by the front tyre. The small nature of the sidepods is made obvious by the extension bracket that mounts these conditioners to the ‘pod itself. Moving further downstream, the packaging at the rear of the car is incredibly tidy. The bodywork shrink-wraps around the power unit below, the bulges revealing where the turbocharger unit (upper bulge) and one bank of the V6 engine (lower bulge) are positioned beneath the car. The sidepods themselves taper inwards to a small openings ahead of the rear suspension. On the launch car these apertures were incredibly small, although these have since been opened up slightly since testing began. The larger outlets re-profile the sidepods slightly and they look similar to the overhanging Coanda exhaust bodywork of last year, although slightly smaller in size. This allows more room for airflow to pass towards the top of the diffuser without compromising cooling. Further shrink wrapping around the central exhaust exit is evident, with a shark fin engine cover in place to meet the required bodywork dimensions instead of a central cooling exit taking up this space. A pair of cooling nostrils have been placed either side of the engine cover to reduce engine temperatures further. Towards the rear of the car, Mercedes have introduced a number of changes to suit the 2014 regulations. 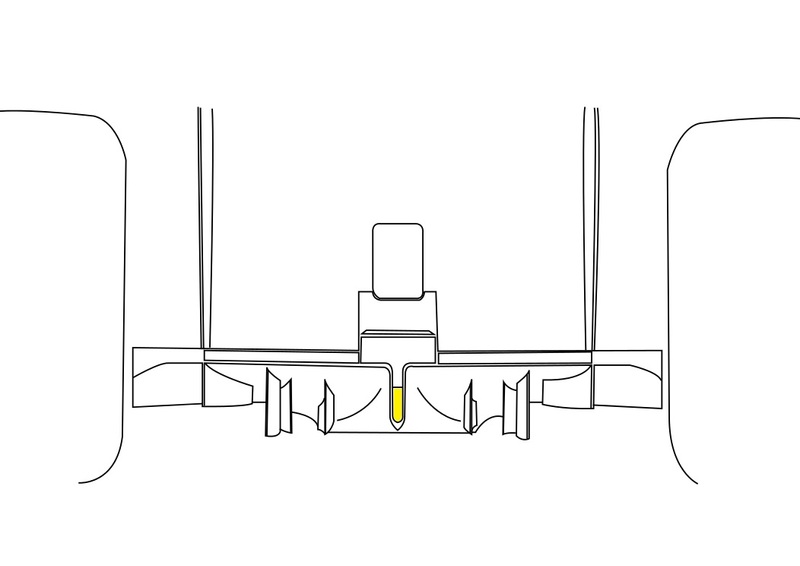 The red circle encompasses two devices that aid rear downforce: a vertical fence and a tyre slot gap at the trailing edge of the floor around the rear tyre. Starting with the fence, this guides high energy airflow, derived from the VGs on top of the sidepods, towards the gap between the sidewall of the diffuser and the rear tyre. This offsets the wake caused by the tyre, driving it away from the floor and acting as a seal. 2014 bans the use of exhaust gases acting as aerodynamic aids to the car’s floor by moving the exhaust exit to the upper centre of the car, but retaining the floor fences and VGs allows a similar effect to occur but on a much smaller scale. Helping this process is the continuation of running a floor slots. The metal add-on piece ducts airflow beneath the floor, acting as a diversion to the turbulent air being projected off of the moving tyre. Added to the top of the diffuser are a number of vanes that originally appeared on the Red Bull RB8 in 2012. These have since been adopted by Ferrari (last year) and now Mercedes have also opted to use them. The vanes guide airflow from the undercut of the sidepod to specific regions over the top of the diffuser, producing a larger pressure gradient between the top and bottom surfaces of the car and thus extracting more rear downforce. The yellow box highlights the ‘tyre squirt’ leading edge slot that draws turbulent air produced by the rear tyre away from the diffuser walls. This slot is now longer and lower down than last year to boost this effect. The official Mercedes images of the W05 do not show a detailed shot of the rear wing endplates, so I have tried my best to highlight the new twin slots towards the rear of the endplate. Unlike the leading edge slot, these cutouts transfer airflow from the inside of the ‘plate to the outside. The positioning of them is curious as normally these outward-facing gaps are placed lower down, hanging off of the endplate itself. I believe it could aid the outwashing process of the diffuser below and the rear wing above, perhaps to try to emulate some of the effect of the now-banned beam wing. These slots are aided by the indentations made in the endplates which extend upwards. The direction of these indentations give us some indication of where the airflow exiting the slots is travelling to, although their purpose remains a bit of a mystery. 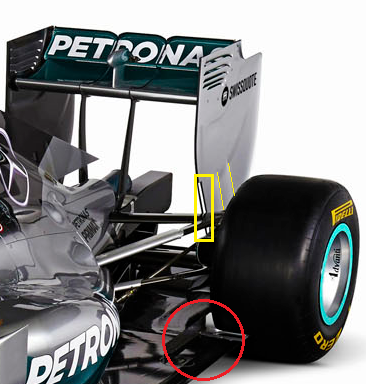 I have highlighted an intriguing section in the middle of the W05’s diffuser. Normally this central area is used to rapidly expand the airflow beneath the floor to generate downforce. However Mercedes have instead split this section in two with a long ‘u’ shaped hole. The yellow section shows an opening to the starter motor hole, although the entire ‘u’ is open to oncoming airflow as a piece of carbon fibre attached beneath the rain-light acts as a large gurney flap, restricting the flow passing through. No other car features such an aerodynamic device and it remains unclear as to what Mercedes are trying to achieve. After some thinking, my guess would have to be that it helps when the car is in yaw. Although the ‘u’ reduces surface area, it will help keep the airflow in a straight line as it passes out of the diffuser which could aid airflow expansion. Without the ‘u’ shape, the airflow paths could cross over as it exits the diffuser, causing turbulence further behind the car and thus restricting expansion. But that’s my guess and I have no evidence to support this. Edit (21/02/14): The ‘u’ shape is related to the ban on using the starter motor hole as an aerodynamic device. More on this as and when information arrives. Mercedes have also retained the extreme outwash diffuser design despite many expecting it to disappear after the Coanda exhaust ban. Outwashing the low pressure air below the car is almost as effective as upwashing it, as expansion is faster at the rear of the car. It is interesting to note their choice of rear wing mount design. Instead of either adopting a central pylon or attaching the rear wing to the top of the diffuser, Mercedes have chosen a hybrid of the two. This reduces the cross section of the two pylons used to connect the main plane of the rear wing to the top of the rear crash structure, as additional support is provided by two small attachments to the floor from the base of the endplates. This solution saves a bit of weight whilst increasing aerodynamic efficiency, as reducing the thickness of both the pylons and the attachments to the floor present less blockage to the oncoming airflow. Having already admitting earlier this week that the W05 was over the weight limit, design ideas such as this one will help slim down the Silver Arrow before the first Grand Prix in March. 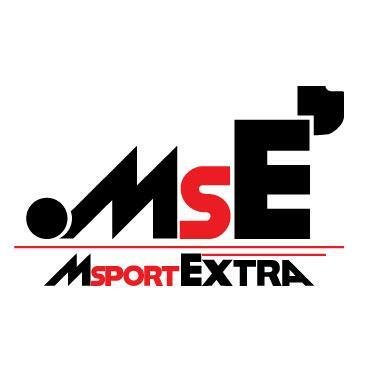 This entry was posted in 2014 Launches, Car Launches and tagged 2014, analysis, car, f1, launch, mercedes, technical, w05 on January 30, 2014 by thewptformula. Great analysis. I believe the mercedes is slightly tighter packed at the rear then even red bull, no? 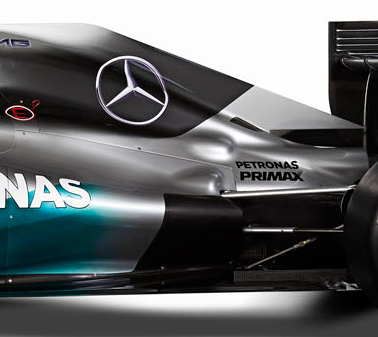 It might be a slightly bulkier in width, but the exposed shark fin, which only is to meet the regulated bodywork requirements, is unique to the mercedes, while other teams had to encase it with cooling outlets and the like. Yes, the packaging is a little tighter on the W05 although Mercedes have (wisely) open up the sidepods a little before the rear suspension, whereas the RB10’s continues to bottleneck which is what has caused the overheating issues. Ah, I knew it was too-tight packaging (sounds like obscenely small jeans…) that caused the problems, but didn’t know quite where. They’ve got to resolve that and the ‘excessive oscillations’ of the Renault engine, which is obviously an issue for Renault. Caterham seemed to get in a fair spot of running on the final day, so maybe the engine supplier’s already made a spot of progress in that area. Renault had to do some hardware and software changes but it still didn’t fully pay off. Caterham had a conservative cooling strategy (huge outlets, you could see the whole gearbox), hence why they could get some more miles done.